No Blogging for Old Men: The Small Screen: The Young Pope "Episode 1"
This past Sunday, HBO debuted the television series The Young Pope (it has already played in full and been renewed for a second season in Italy where it was broadcast on Sky Atlantic) but prior to ever hitting the airwaves, the series had become a hit for all the wrong reasons across social media due to its premise seeming ridiculous, resulting in a wave of memes and jokes aimed at the show. Despite this, I was never not going to give The Young Pope a fair and open-minded shake considering its creator Paolo Sorrentino, whom I have only seen two of his films but one of which is The Great Beauty. That one masterful movie is plenty for me to know that when he is in charge, greatness potentially awaits. - The show is as bizarre as trailers made it seem, at least up front because who knows how the tone will settle in as it goes on? Well I guess the answer to that is the many, many Italian citizens who have already watched the entire season know. I refuse to do any further research on that front though, I want no spoilers of any kind. I was surprised and riveted by the first hour and have no idea what is in store going forward. - As I just said, riveted. Even when The Young Pope was at its most ridiculous, it never made me want to reach for the remote to change the channel but rather turn the volume up and lean in a little bit more. I'm in to see where Sorrentino takes this. - In case you aren't familiar, the premise of The Young Pope is that the first ever American born Pope has been elected, a man in his 40's born Lenny Belardo (Jude Law) now known as Pope Pius XIII. Silly, right? Absolutely, yet as I was watching the episode it occurred to me that House of Cards was deemed silly early in its run, and then the 2015/16 political rise of Donald Trump happened in reality and made the show feel almost grounded in comparison. Who knows, in 5 years we may actually see a 30 something get elected Pope despite photographic evidence of his relations with prostitutes and cocaine addiction. - Jude Law is perfectly cast. Perfectly. 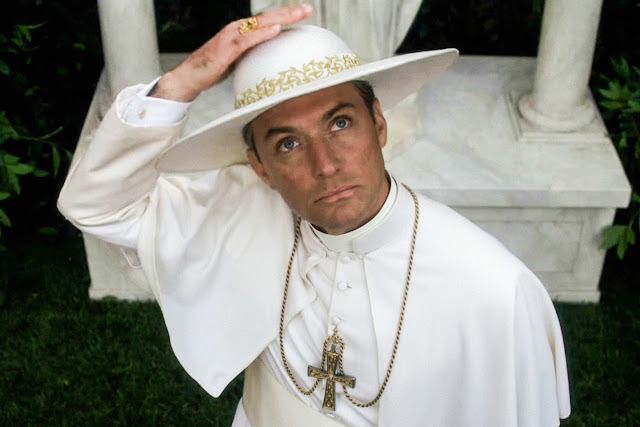 If you are going to sell an audience on a young Pope and make him good looking, charismatic but just creepy and unsettling enough to push the series down an intriguing and potentially very dark path, Jude Law works wonders. Just see his work in Road to Perdition to understand creepy and unsettling, it's the role I always think of when someone mentions Law as an actor. - I can't be alone in thinking that despite the silly premise and the odd first episode, I am willing to bet The Young Pope ends up being a drama that demands to be taken seriously in the end. I believe in the talent involved. 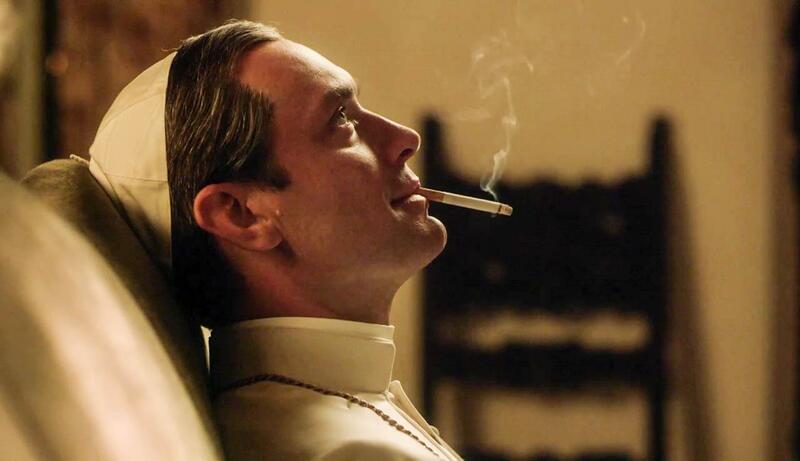 I'm pretty much booked solid for the entire first season and beyond of The Young Pope unless this series goes really off the rails at some point. Check out the first episode replaying on HBO, On Demand or on HBO GO or HBO NOW to see for yourself if the tone does anything for you.